We have a old walnut tree in our yard here on the island. It's riddled with woodpecker holes and no longer produces much, but each year I get a small harvest of tiny but flavourful nuts. Last year, though, I finally got fed up with trying to shell the walnuts after I had picked them in the fall. It would take me hours to pry the shells off a few small handfuls and when I used them in baking I'd often crunch down on an errant piece of shell. Now I pick the nuts while they are green, before the shell has formed, and I make pickled walnuts, an English specialty. "I didn't expect, when I moved to the western shores of Lake Neuchatel, in Switzerland, that I'd find small hand-written signs advertising "Fresh Walnut Oil for Sale" on many fences and doors. Then I discovered that walnut trees grow quite well around here; in my area people actually bid on the crop of any given tree (which in this case are owned by the municipality) and are then able to gather the crop of nuts and take them to be pressed at a local oil mill which has been functioning for several centuries. And therein lies a tale, as they say! I admit that I was intrigued, so when I got an invitation from a colleague to come with her when she took her family's walnut crop to the mill, I instantly changed all my plans for that afternoon and accepted with pleasure. The Severy Oil Mill is the last in Switzerland functioning year-round, in the old-fashioned way. Tucked away in a fold of valley near the small town of Severy (in the north of Canton Vaud, against the Jura foothills), it was built in the 13th century and has been owned by the Bovey family since 1845, making this generation the sixth to perpetuate the skill of the artisan oil maker. In the old days, each village usually possessed its own grain mill, a carpenter's shop, a fruit press and an oil press, as well as a community bake house. At one time the mill was run using an enormous waterwheel, but has now been transformed to work using electricity and gas. So off we went to the oil mill, with two large cloth bags of hulled walnuts, the production of the family tree (32 kilos of hulled nuts), and a large empty milk jug to bring the oil home. I was told that this year was a good year for walnuts, unlike last year when there were almost none. Once again "in the old days", not so very far off really, families who had several walnut trees (which can produce at least 100 kilos of nuts apiece!) 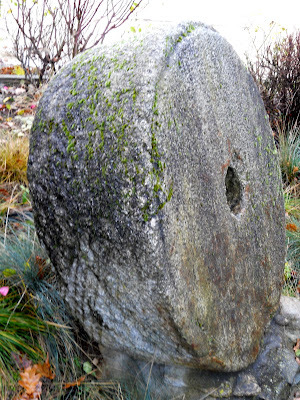 would spend evenings together hulling the nuts, talking, telling stories, singing...apparently one or two people would break the hulls with hammers on a stone base and the others would retrieve the pieces of walnuts, being careful to remove as many pieces of nut-shell as possible. Of course you always find a few, later, anyway! My friend's mother says that hulling walnuts is a nice way to spend the dark evenings, and can be done at any time after the nuts have dried a bit after the harvest, so nut shelling actually continues well into February, depending on the time available to do it. Each family can, if it wants, have its own nuts pressed in one batch, and from what I hear that's what most do; it's a 3-hour process or so depending on the quantity of nuts you deliver. We came upon the mill because we knew where it was; if you didn't you might go around in circles for some time till you found it! 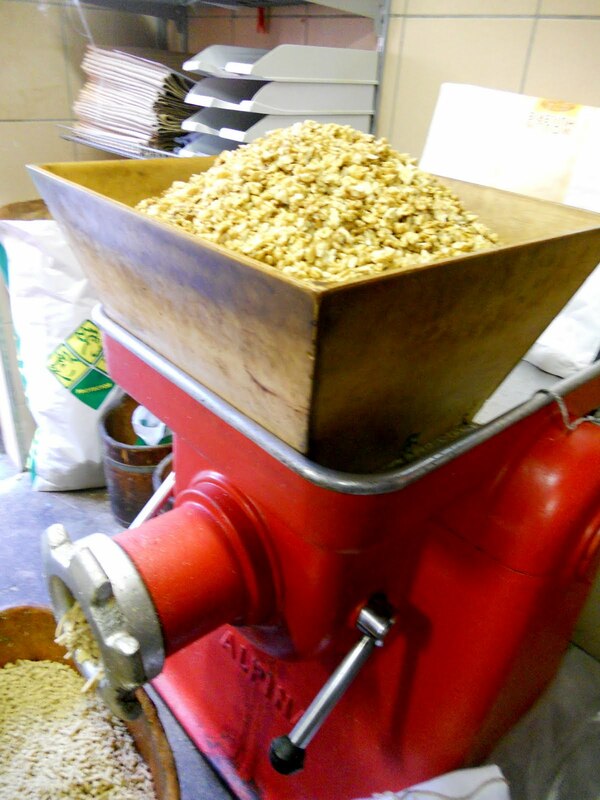 My first impression on entering was the pervasive and rather lovely smell of lightly toasted nuts, the huge bags of shelled nuts waiting to be weighed in, and the rhythmic background noise of the wheels and pulleys constantly clicking. 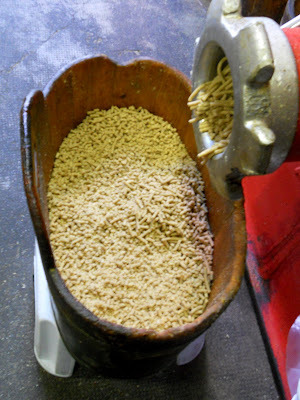 After our walnuts were weighed, they immediately went into the big wooden hopper to be ground into pellets, which looked rather like dog food and quite unappetizing. 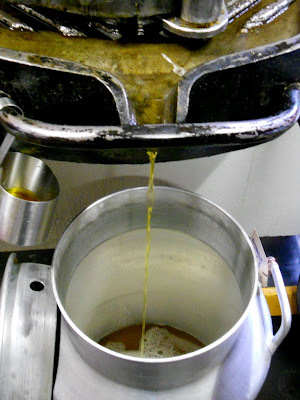 They come out of the hopper into a lovely old wooden container which is so soaked with nut oil that it positively glows. I touched it later, thinking it would leave an oily film on my fingers, but no, it was as smooth as velvet, a really beautiful old piece still in constant use. 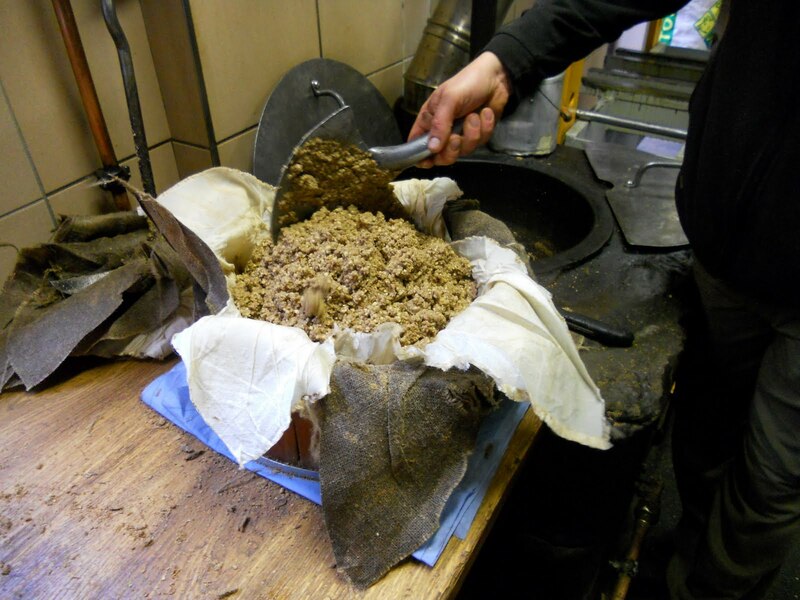 Then the nut pellets are poured into a toasting pot which is set into an old stone stove. A ladle of water is added to prevent them from scorching while they toast, then the lid is closed and a paddle swishes them around for a few minutes. 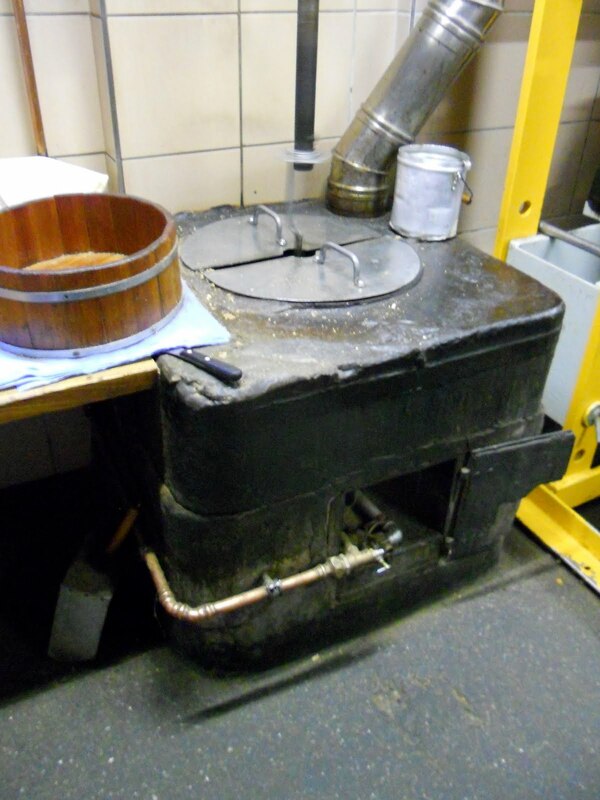 The stove is about 175 years old, I was told, and was wood fired until 1997, when it was converted to gas. You can imagine the work to keep it constantly fired, from the wood chopping to feeding it regularly. It's a beautiful old thing too, releasing a constant gentle heat. 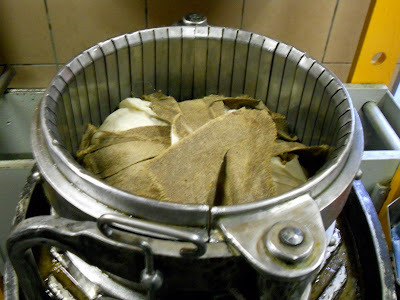 When the nuts have been toasted, they are scooped into a cheesecloth-lined round wooden form (also very old), wrapped up well, and put under the press. I enquired about how much weight they were pressed with, and the young man who was handling "our" nuts said, with a completely straight face, "60,000 tonnes! "...and as far as I can tell he was serious! The lovely golden oil started to flow almost immediately, and when each form was pressed (which took 15 - 20 minutes) it was removed from the crushing weight, unwrapped, and the cake of residue (called nillon) set aside either to be returned to its owners or to be ground or broken into chunks for sale at the small adjacent shop. Not so very long ago, schoolchildren would be given chunks of the nillon as a snack for school, which I'm told was sucked or nibbled on and I'm sure it was a very filling and cheap snack at a time when treats were few and far between. 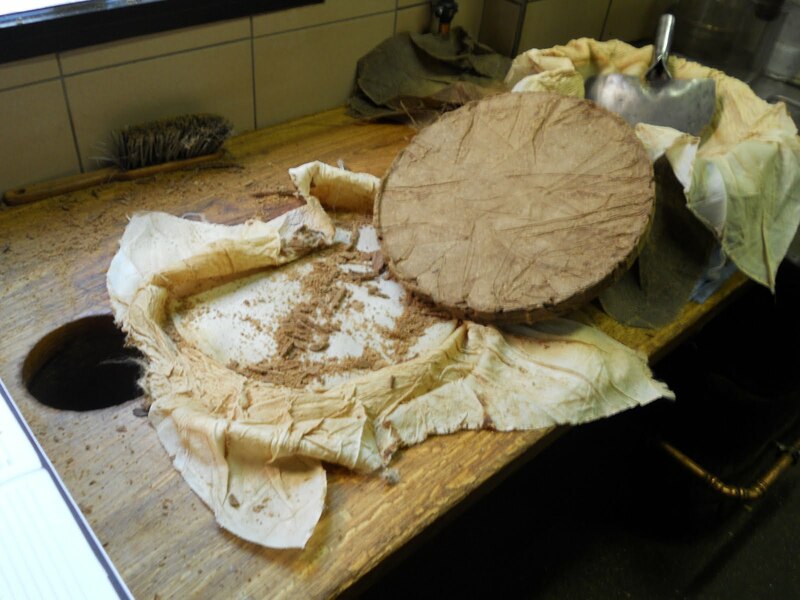 Now, people can purchase the nillon and use it to make a local specialty called "Ground Walnut Tart" which is rich and filling and served in tiny slices. When it's baking, you can smell the wonderful scent of walnut oil all over the house. 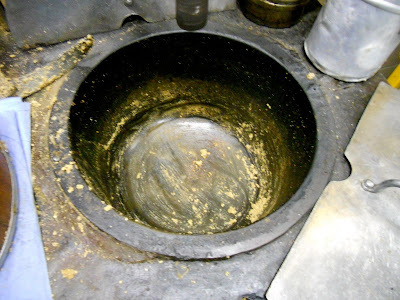 When we left, with our large milk container two-thirds full of freshly pressed fragrant oil, we felt like our clothing and hair were also permeated with the lightly toasted walnut smell. The men who work at the mill say they enjoy it when they press a different kind of oil, just to have a different smell! The oil will now be left to settle for about two weeks, then filtered, bottled and kept in a cool storage area, generally the cellar. 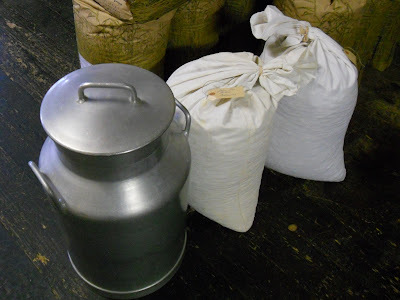 With over 20 litres produced from the 32 kilos of hulled walnuts I think my friend and her family will have enough for some time to come. The Severy Mill produces at least eleven beautiful cold-pressed oils, including walnut, hazelnut, canola, sunflower seed, almond, peanut, sesame, pistachio, pine nut, grape seed, pumpkin seed, olive and truffled olive, as well as a number of flavoured vinegars, mustards, sauces for barbecues, and other delicious products, all produced, bottled and sold at the mill or by mail order. All of the oils retain their Omega-3s and wonderful scents, and are mostly used as condiments because they don't react well to being heated (except for the canola, peanut and sunflower seed varieties). It only takes a very small amount of oil to flavour a vinaigrette or other sauce, so it's possibly more economical than you may think. My experience with it is that a small bottle can be kept in the fridge and lasts quite well; I never purchase more than a half litre at a time. Of course it's a luxury to be able to use locally produced oil, and it fits in well with my Slow Food, locavore mentality. I also enjoy giving small bottles as gifts and hope that this mill will continue its service to the community and to local food lovers for many years to come. The Severy Mill functions 14-16 hours a day from October until around late May, then the rhythm is slightly less intense and group visits are possible. Open from Monday to Friday, 7:00 - 12:00, 13:00 - 18:00, Saturdays 8:00 - 12:00, 13:00 16:00." Chris is sending me a bag of nillon to play with (I wonder what the customs officer will think of it?) and I'm looking forward to experimenting with it in my baking. 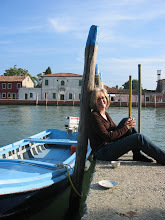 I hope that Chris continues to keep us up to date on her locavore adventures. This entry was posted on Monday, January 02, 2012 You can follow any responses to this entry through the RSS 2.0 feed. You can leave a response, or trackback from your own site.